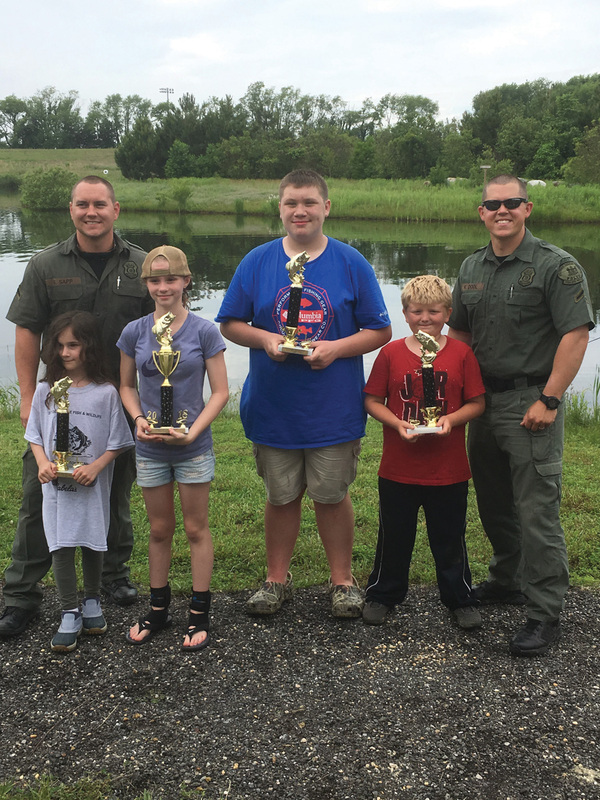 Above the children pose with their trophies from DNREC’s Fish & Wildlife Natural Resources Police 32nd Annual Youth Fishing Tournament. From left are: Carly Clevens, first place ages 4-7; Kent winner Adrianna Gott; Trevor Torbert, first place ages 12-15; and Connor Wyatt, first place ages 8-11. 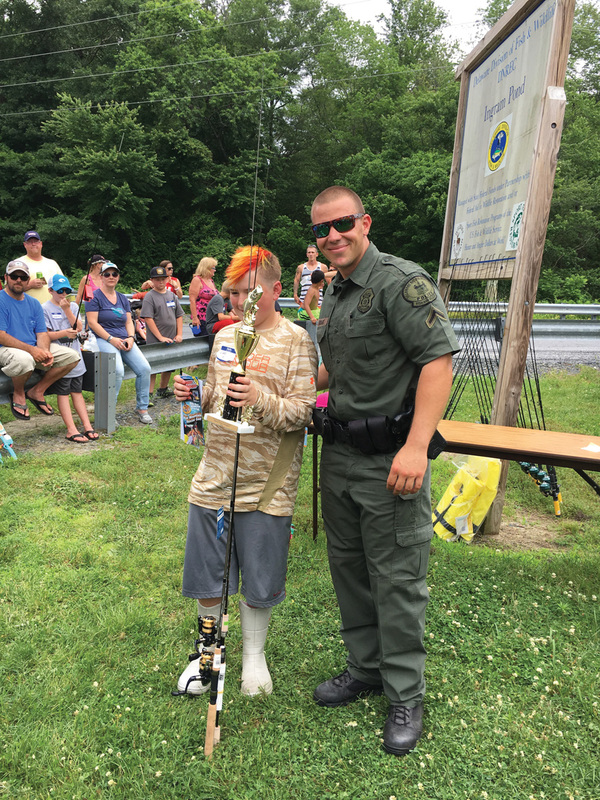 Under mostly cloudy skies that some would call good fishing weather, 213 young anglers and their families gathered Saturday, June 2, at three Delaware ponds for DNREC’s Fish & Wildlife Natural Resources Police 32nd Annual Youth Fishing Tournament. All fish caught in the tournament were weighed and released, as young anglers got a first-hand lesson in conservation. 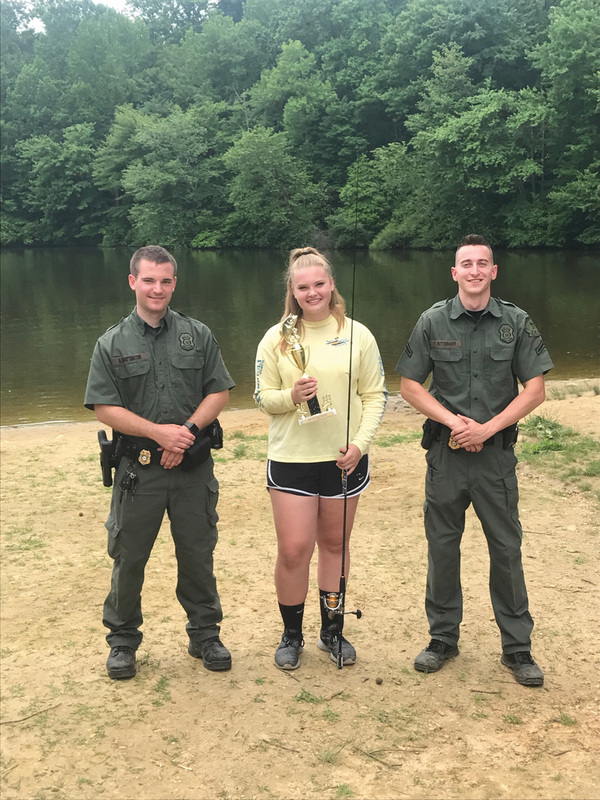 When the day was done, 14-year-old Elise Britton of Middletown came out as overall statewide winner, as well as the New Castle County winner, for the second year in a row, with her largest catch, a 7.94-pound carp, the largest fish caught in this year’s tournament. This year’s county winners and the overall statewide winner will be invited to a special trophy presentation on Governor’s Day, Thursday, July 26, at the 2018 Delaware State Fair in Harrington. • Ages 4-7 — First place, John Timmons V, 6, of Georgetown, 3.15 pounds; second place, Madison Culley, 7, of Laurel, 1.87 pounds; third place, Joseph Lawson, 7, of Laurel, 1.33 pounds. • Ages 8-11 — First place, Edvardo Lopez, 10, of Selbyville, 4.26 pounds; second place, Ava Puddicombe, 11, of Laurel, 3.95 pounds; third place, Nathan Green, 11, of Millsboro, 2.53 pounds. • Ages 12-15 — First place, Zachary Hicks, 13, of Greenwood, 1.43 pounds; second place, Garrett Rogers, 12, of Millsboro, 1.16 pounds; third place, Camrin Croney, 12, of Ocean View, 0.90 pounds. Tournament winners received trophies and prizes, and all participants received prizes. This year’s tournament donors and supporters included statewide donor Cabela’s, and, in Sussex County: Dewey Beach Lions Club, BJ’s, Dairy Queen, Jungle Jim’s, Funland, Lewes Harbour Marina, Lingo Marine, Short’s Marine, Rick’s Bait & Tackle, Hook’em & Cook’em Bait & Tackle, Millsboro McDonald’s, Old Inlet Bait & Tackle, Ice House Bait & Tackle, The Lead Pot, and White Water Mountain. The Youth Fishing Tournament was established to introduce youth to the sport of fishing and to teach the catch-and-release approach to conservation. The tournament, held annually in June, is open to youth ages 4 through 15. For more information on the Youth Fishing Tournament, call (302) 739-9913.